Was anyone else confused by the fact that some people take Columbus Day off? I wasn’t aware that people actually celebrated this so called “holiday” and so I was curious if I would get work off. Fat chance. That’s a long shot to believe that a business company would take a relatively unheard of holiday like Columbus Day off. But, one can dream, right? Although, come to think of it, I’m not too sure what I would do if I did have it off. I would probably try to find a pumpkin patch or maybe even carve a pumpkin. Speaking of pumpkins, I’ll probably continue to include them in my daily or weekly ramblings for the next two months. I’m honestly not sure why I enjoy pumpkin so much. My friend asked me this the other day and I couldn’t really come up with a solid response. It may be due to the fact that pumpkins = fall, which = holidays. This introduces decorating and festivities and so much more. I have no qualms about purchasing each and every product that Trader Joe’s sells, especially when it contains the word “pumpkin” in the title. Between biscottis and bread, lattes and ice cream, I’m about to turn orange. Sunday afternoon I decided to put my good baking skills to use and create a pumpkin-banana bread and set of pumpkin biscottis to call my own. 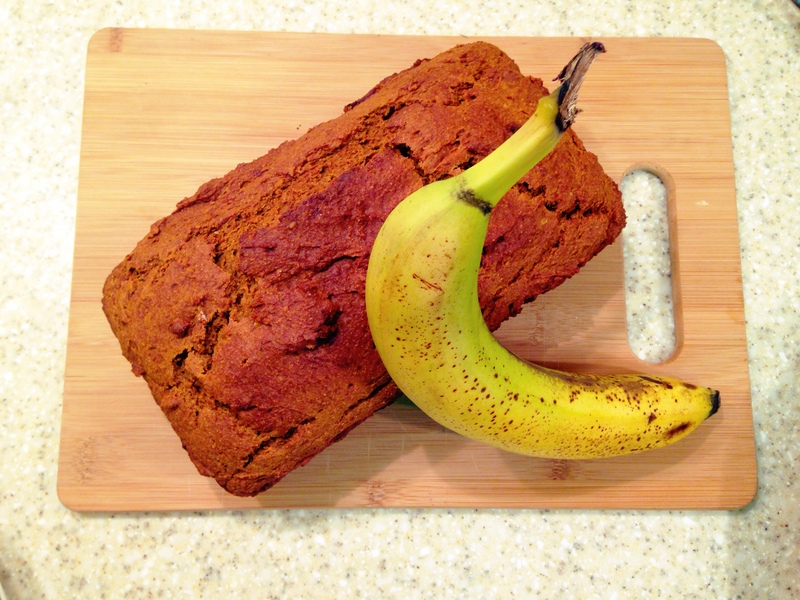 The pumpkin-banana inspiration came about on Friday when I was left with six overripe bananas left in the work kitchen. So, after hopping around different websites, gathering tips and tricks, I arrived with this creation. Preheat oven to 350°F, grease loaf pan. In one bowl combine flour, baking powder, cinnamon, baking soda and salt. Stir until it’s well mixed. Combine pumpkin, eggs, sugar, bananas, and oil in a larger mixing bowl; beat until smooth. Slowly add in the flour mixture and beat until just combined. Pour into loaf pan and set in the oven for about 50-55 minutes or until a toothpick comes out clean. In other news, my friends and I have officially set up weekly weekend runs in Central Park. This weekend we ran both Saturday and Sunday in the park and although my legs are just getting back into speedy shape, it was wonderful. There are trails and paths and tons of people out and about. To me, a run in the park, surrounded by like-minded people, and a quick coffee and trip to the farmer’s market, makes for a wonderful weekend. What makes for your perfect weekend? 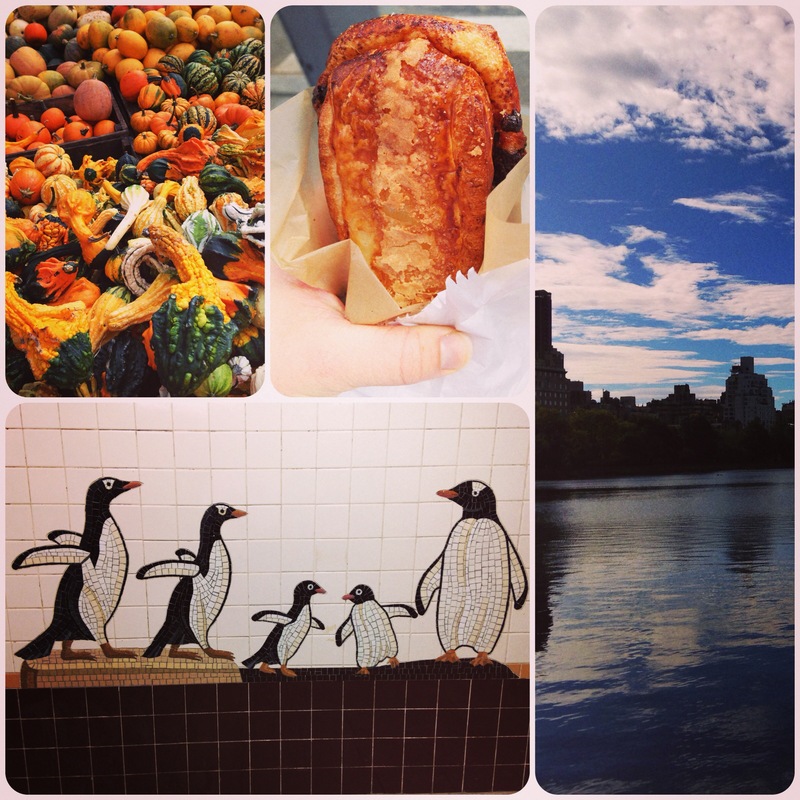 This entry was posted in Fall, New York and tagged Central Park, friends, happiness, New York, pumpkin, running, weekend by Kaitlin. Bookmark the permalink. I use to get columbus day off in NYC, but not happening in Denver, unfortunately 😦 I did a little walk through CP yesterday! Wasn’t it great? I heard after the fact that Banksy had a bunch of his art in one of the little stands! Ya know, I can’t exactly pick out WHY I love pumpkin so much, but I DO love it dearly! I’m going to go with your logic and say its because it reminds me of the holidays…. Anywho, running dates, farmers markets, and coffee trips sound like an ideal weekend! Throw a little cooking and wine somewhere in there and I am a happy camper! Oh, those are certainly essential additions! Everything is so festive! It really is a perfect combination!